Image from Flickr by symphony of love. Asking people to do their best, to seek excellence, on a key project or top priority seems like the ultimate cliché of coaching. Blogs, books, and quotes related to this simple idea abound. What does doing your best truly mean? For most of us, it often seems impossible, given the image we have in our minds about how our “best” can look. Consider the idea that we all have a “best continuum,” in which what we’re capable of varies depending on the day or time. Consider, too, that your actions are like planting seeds and tending a garden, where all efforts count and add up. 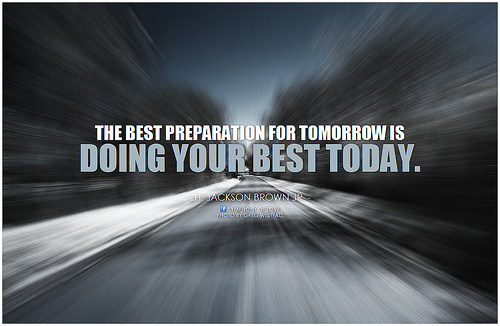 What does your best effort look like today? Take a moment to acknowledge and appreciate yourself, knowing that the sum total of all your daily bests will bring you the harvest you seek. This entry was posted in Achievements, Attitude, Effort and tagged achievement, attitude, Barry Demp, Demp Coaching, effort, Excellence, The Quotable Coach by Barry. Bookmark the permalink.